Heat the pan with oil, stir fry carrot, cabbage, and tofu for 5 minutes. Add sprouts and salt and cook for less than 2 minutes. Let it cool for 15 minutes or until it is cool enough to handle. In each sheet, put about 1 tbsp stuffing/vegetables on one end, seal the wrap tightly with some water. Meanwhile, heat a pot of oil to deep fry the spring rolls. 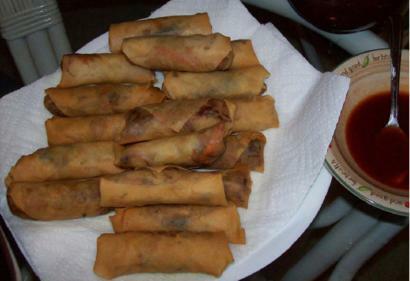 It will not take more than 3 minutes to make a batch of spring rolls. * Spring roll wraps are available in most grocery stores/Asian food stores. They come in two different sizes: big and small. Just make sure the wraps do not contain eggs. If you cannot find any in the store, you may use fillo sheets. **If flavored tofu is nowhere to be found, you may use soy meat (seasoned), any vegetable, or simply omit this item. •Mix all ingredients in the blender for 15 seconds.